Monday, I went in to see a chiropractor for the first time. When I was younger, I was terrified of chiropractors - the neck popping - ugh, no thank you! Well, now that I'm a bit older and more prone to ailments, I've slowly come around. The manfriend is a big fan of the chiropractor and goes a few times a year when his back is bothering him to get adjusted. Granted, he should probably do a little yoga (ahem!) and some more preventative care, but that's beside the point. I went to see Dr. David who is well liked in Eugene. His office was very efficient. I had my paperwork filled out on Friday (thanks to the documents they provide on their website) AND knew how much my copay would be before I got to the office. Because it was my first appointment, I had an assessment done to see what areas were issues (one of the assistants used little electrode things down my spine to chart this on the computer). Then, Dr. David came in and explained chiropractic care, talked about what I'd like to make better (low back, neck, left foot) and felt along my spine. He located a few spots with "subluxations" where my spine was slightly misaligned, possibly from a number of things - sports injuries, falls, poor posture, etc. What I was hoping to get treated for: Lately, I've been having a bit of low back pain, which sometimes turns into numbness. Then on Friday during lap swimming, my neck was feeling a little tweaked. And my left foot has felt really locked up lately. I also mentioned that my left shoulder area is constantly locked up and popping thanks to (I think) an old lacrosse injury. He then explained a bit more, said he felt like my pain could be helped by chiropractic and I let him get to work. With each pop and crack, he explained what was next before any popping or cracking happened. I just focused on remaining calm and breathing deeply, which helped. The last thing I wanted to do was flinch and cause more pain than healing. After a few key adjustments, he had me stand up and walk around. It was amazing the free and open feeling I noticed in my back and spine. It's sort of hard to describe, but it sort of felt like everything just had a bit more room to move around. The adjustments were fairly harmless and did cause some popping sounds, but nothing that was painful. Also, chiros use this table that gives as they do the adjustment so that adds to the noise factor. Dr. David told me to walk around the block before getting back into my car (and sitting all afternoon), ice if I need to (but no heat) and drink a ton of water. He also warned I might be a little sore for the next day. He was right. I was a bit sore in my neck area and low back Monday evening and Tuesday. I did use a little ice on Monday night, but now things feel fine. Have you ever seen a chiropractor? Did you have good results? I'm curious to see how this next appointment treats me. I'll let you know! I did something to my neck a couple of years ago and had to see a chiro as I seriously could not turn my head. It was awful. Turns out I had minorly sprained it, and it was caused by stomach sleeping. I broke that habit and have done much better ever since. I have to go back for the occasional adjustment, but not very often. It was a little bit scary at first as it really makes weird noises when he did the adjustments, but I got used to it. I hope the chiro sessions help you! I hope it helps you! I found that going to the Chiropractor helped me immediately, but it seemed like the problem returned shortly after, and then once I went back I felt better, but then it came back again. So. I am not really a fan, as it seems like it was short lived in my case. Haven't ever been to a Chiro and, to be honest, probably never will. That cracking scares me and I'd much rather opt for a massage (less scary, more relaxing)! I looooove my chiropractor - She's amazing! I find that going to the chiropractor is the only effective relief I can get for a lot of my nagging aches in my lower back and hips. I always feel inches taller when I walk out of the office! I love a chiropractor and have had great success with dealing with my scoliosis through chiropractic care. I hope it continues to help you! Glad your trip helped you! I LOVE my chiropractor. I mostly only get ART done but occasionally she cracks my back or makes adjustments to my hips. I credit her with helping me heal from my injury after the Portland marathon and since I've been seeing the chiropractor regularly I've also had injury-free training cycles. I am glad that you had such a great experience! I swear by my chiro, he has helped me so much. When I was training for Eugene I saw him at least once a week. I am petrified by the idea of going to a chiropractor! You're braver then me. Although I'm glad it seemed to work for you!! I LOVE LOVE LOVE my chiropractor. My chiro isn't a traditional "crack'n" chiro. She uses the Active Release Technique and occassionally cracks something at my request. I'd recommend finding a chiro that does Active Release! My mom goes to a chiropractor for her back too - she swears by it. I see a chiropractor for my legs for ART and I love it. I, for one, am very glad that your first trip to a chiropractor left you with a positive view on the practice. I applaud you for setting aside your reticence about chiropractic and just going for it! 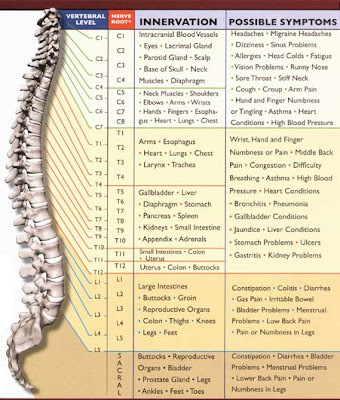 Isn’t it amazing how a few simple tweaks on the spine can do wonders for the body? The spine is the main part of the skeleton that holds us up, so treating it with care is to treat our health with care as well. I know a lot of people are a little hesitant about the practice, but hopefully testaments like yours will help spread the word about the true benefits of chiropractic. Hope you enjoy your future visits as much as you did with your first one! Good to hear you enjoyed your first session of chiropractic treatment. :) I think Dr. David is quite the at chiropractic care, given that immediately felt the difference the first time your tried it. There are some people who only feel the effects of the treatment a couple of sessions after the first one. Anyway, how is your back now? Did the chiropractic do the trick?